Talk to long-time residents in the University Heights neighborhood and ask if they remember my father-in-law, when yes, the answer typically is the same: Riding his bicycle. A lanky man of advanced age makes a long-lasting impression—must be since he gave up the two-wheeler five years ago. 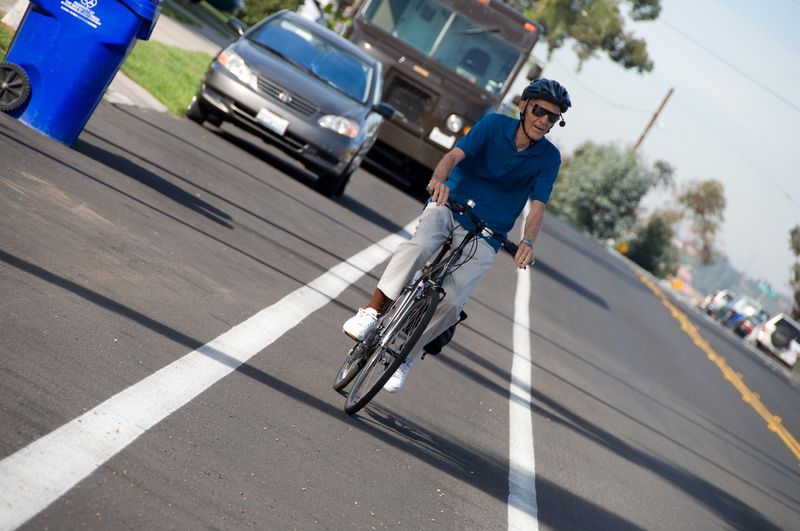 Here, he rides a new bike down Cleveland Ave., on Nov. 13, 2008. At that time, he rode 1.5 km or more most every day—including jaunts down Washington Street that even I wouldn’t risk. By 2012, he switched to a pedal-electric hybrid. A few weeks before Thanksgiving that year, someone stole Bob’s bike from his apartment complex’s laundry room, after failing to get coins from the washing machines. He never rode again. Today, my wife and I closed out her dad’s apartment. He died on Jan. 11, 2017, the month after reaching 95 years-old. The last item to go was his kitchen table and chairs, which I posted for free to Craigslist. I stared long at the smokey-glass top table, reminiscing, while waiting for the pickup. Anne or I spent most of our time visiting her dad seated there together. Somehow it’s fitting the dining furniture should be the last belongings to leave his place. The gent getting the set is Mexican and lives in Tijuana. His brother just moved into a new residence and needs furniture. As he and his middle-school-age son loaded up the pick-up truck, I wondered how I would remember the moment. Will I reflect upon it as a metaphor for changes underway? During the preceding 24 hours, President Trump issued Executive Orders or made policy announcements that promise dramatic changes for the flow of people and goods across the border with Mexico—something sure to impact San Diego, which, hell, municipal Trolley runs all the way to the border; walk across, and you’re in Tijuana. That alone says much about U.S.-Mexican commerce and culture here in Southern California. If the table is a metaphor for what will be, the bike is for what was. My father-in-law sought to remain independent even as the natural order of aging diminished his vitality. Riding allowed him to get around, run his own errands—even at age 90—while providing means of also exercising to keep fit and spry. The table isn’t so dissimilar metaphor—as the newly-inaugurated 45th President seeks to keep America independent and vital by changing how the country competes across the global landscape. Good intentions, but we are all fiercely dependent on one another—whether individuals or nations. Enough. That’s a bigger topic for another day. BTW, I captured Bob’s Bike using Nikon D90. Vitals: f/5.6, ISO 400, 1/1000 sec, 170mm.